Condemned for a crime he didn’t commit, Quinten Peterson sat on death row praying for a miracle. He just never expected his angel of mercy to be the girl he fell in love with so long ago. The press called her a victim, but Saige Lockwood was a survivor. 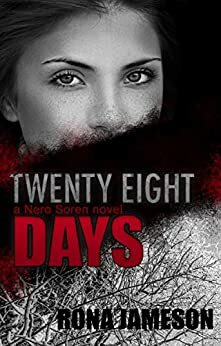 And she had twenty-eight days to discover the truth about what really happened to her that fateful night, eight years ago. With time running out, Saige desperately needed to unlock her memories . . . before it was too late. This book is recommended for readers 17+ due to sexual content. I read this book in one sitting. I HAD to know who did it! My heart broke for Quinten and Saige and what they were both put through. Loved all the little twists to try and throw you off. The writing style isn't what I usually like, written in multiple POVs, but in this case it worked really well. This had the potential to be a really good story but it never really lived up to it. Felt like it needed a good beta read and some tightening up. There were too many things that didn’t add up, too much confusion as evidence was supposedly brought into the light. As I reader I kept thinking, no one in law enforcement would let that happen. I really wanted to like this story because the storyline was original and had so much potential and I desperately wanted it to be all that it promised. Unfortunately, it did not. Even the little twist wasn’t a twist for me but I loved that it could’ve been had this had some additional help with it. I don’t like posting negativity but I have to be honest. That being said, I’m sure there are those who will be able to accept this read as it is without questioning the inconsistencies. 4.0 out of 5 starsGreat mystery with lots of twists and surprises. 28 days is all Quinten Peterson has before he is executed for crimes he didn't commit. Saige Lockwood lost two and a half years of her memory 8 years ago. Now with the news reporting the upcoming execution of the man accused of killing women and abducting and trying to kill her little pieces of her memory are coming back and funny thing is she isn't freighted by the picture of Quinten – in fact she feels something else. Saige has to know about what happened to her 8 years ago and starts the ball rolling on getting people to look into what really happened. On her side helping are Quinten's brother and a Detective who was part of the original case. Quinten and Saige were in love all those years ago and even though she had forgotten, its all now coming back and she is going to do whatever it takes to get her man off of death row. As Saige and the Detective start pulling strings what they unravel is shocking. And even once the unraveling is all done the author throws the biggest shocking twist at the end that you dont see coming. This book was nothing like I expected! It is a thriller with elements of Romance but the emphasis has to be on Thriller. To me this book was like a car crash you don't want to see but can't help. The whole time I was reading it, I really didn't know what to think. Love Lexi Buchanan as an author and have read most of her books. She is an excellent writer and she certainly did this book justice. But wow! Didn't see this book coming! Omg!!!!!!! My mouth is still dropped open from what I just read, witnessed, and lived! I had so many theories most were right. That ending was shocking but it wasn't because I had a hutch about that person. I just hope it's some kind of companion novel that comes out because I want to know more about Alex. Read this book NOW!!! You will not be disappointed. Sorry really not good at writing reviews but I just had to for this book. 5.0 out of 5 starsReally? I can't believe what I just read! In a good way! I normally don't read suspense novels, but the premise intrigues me - and I am so glad. I think this is also the first book by Ms. Buchanan that I have read - but I can tell you it won't be my last. There are so many suspects - but you know that the main characters are truly the innocents. This story will stay with me for some time. Thank you Ms. Buchanan for a great afternoon read.